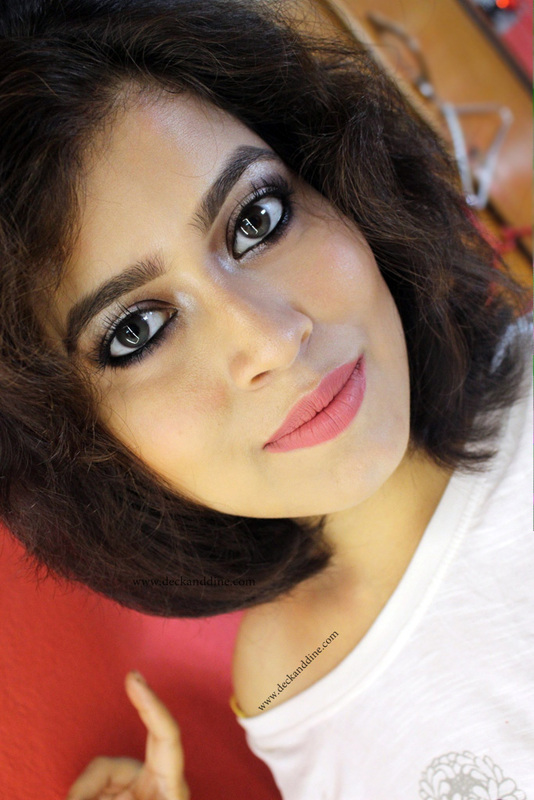 I love colored eyeliners and to me, summer is the best time to go for them. In this sweltering weather, I don’t really feel like applying makeup and thus, a colored eye liner and lip gloss do the trick. It not only looks fun and different from regular browns and blacks, but also amps up your look without much effort. 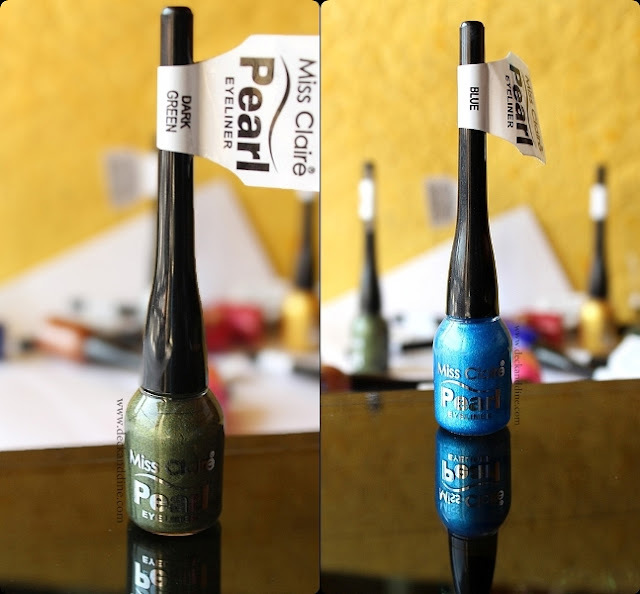 So today I’ll be reviewing and swatching all the Miss Claire Pearl Eye Liner for you. I love Miss Claire as a brand; they provide quality makeup products at unbeatable price. So when I came across these little pots of color, I didn’t think twice and grabbed them all. 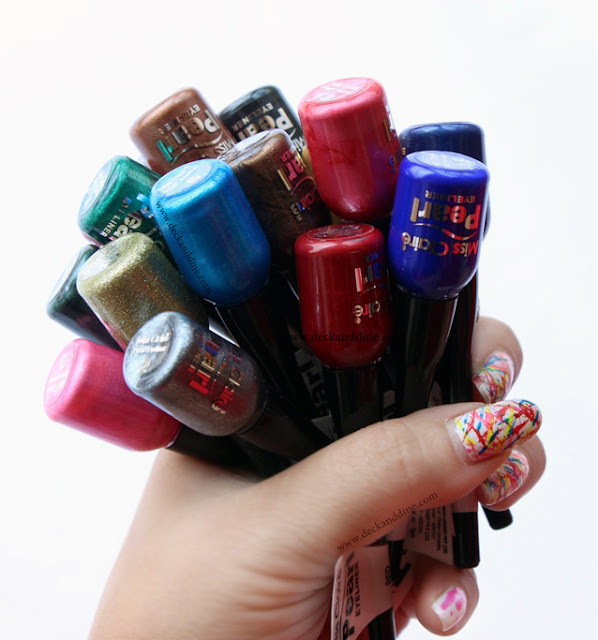 So time to feast your eyes on these 16 of the prettiest colored eyeliners under the rainbow. 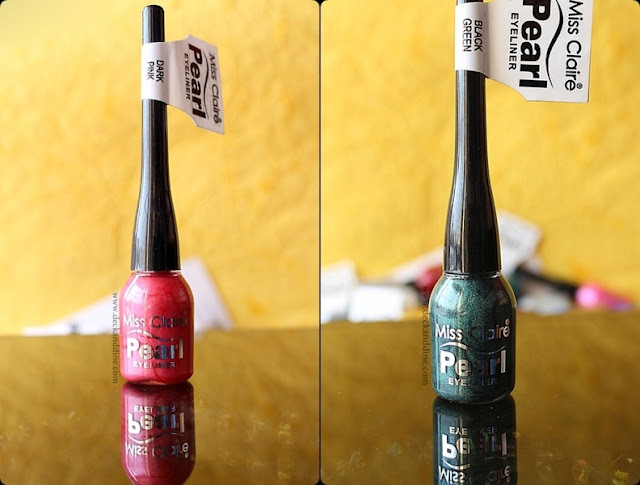 From bright and bold to soft and understated, there’s a shade to satisfy all of your color needs. I got them for 150 each. There are no prices mentioned on the products and the sellers, both offline and online, increase-decrease them as per demand and their wish. To know where you can buy these, Click HERE. They come in super cute plastic bottles with long black caps and brush applicators attached to them. The bottles are transparent, so you can easily detect shades from outside. 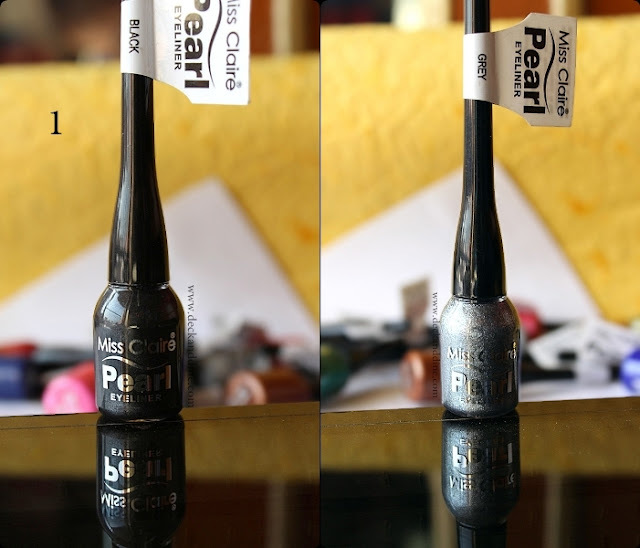 The long cap enables in a firm hold, is easy to control and the brush is of decent quality, puts color exactly where you want it and also helps to create the desired line thickness. Black, No 1:- Stunning black with minute silver shimmers. Gold, No 8:- Stunning gold, very versatile. Red, No 9:- Matte red. 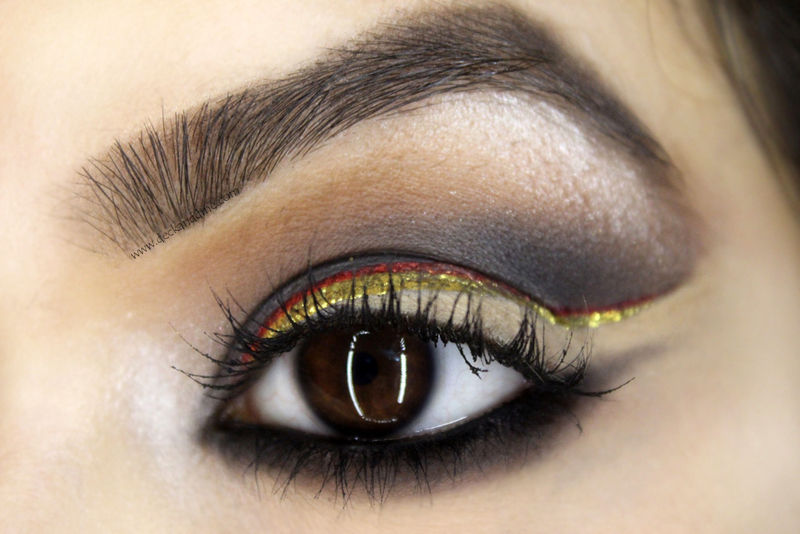 I never thought a red liner can look this sophisticated. Dark Blue, No 10:- Midnight blue in matte finish. One word, stunning. Dark Brown, No 11:- Beautiful brown, with hints of bronze. Silver, No 12:- A versatile shimmery silver. Dark Pink, No 13:- An utterly pretty rosy pink. Black Green, No 14:- A unique shade of darkened green. Black Blue, No 15:- A gorgeous electric blue. 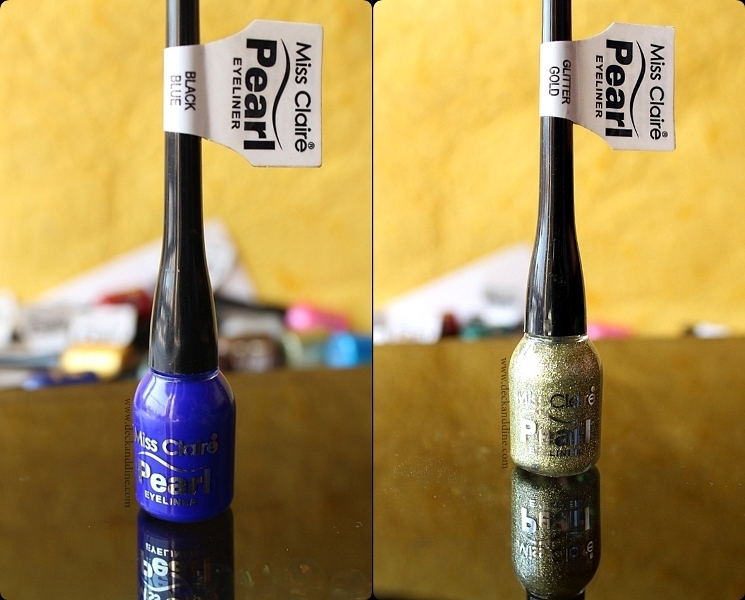 Glitter Gold, No 16:- Golden glitters in clear base. The consistency of these is neither too thick nor runny, feels just perfect. It dries in seconds. 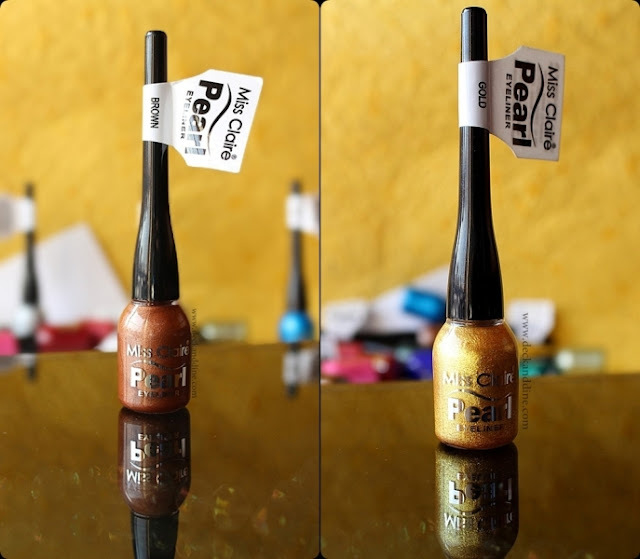 Most of them are very well pigmented and gives opaque coverage in just one swipe, but layering gives a better pigmentation. 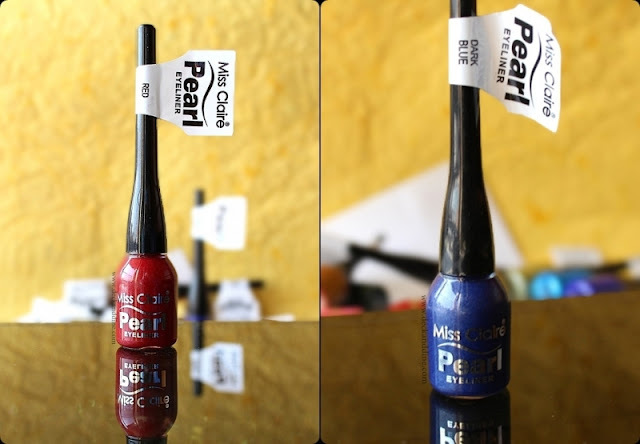 It is a truly long-lasting product that doesn't budge or smudge, crackle or chip, neither peel nor flake. However, note that these are water-resistant and not water-proof, so no-rubbing your eyes. Long applicator with ergonomic grip for a steady sweep. Easily available, both online and offline. I highly recommend these to everyone. 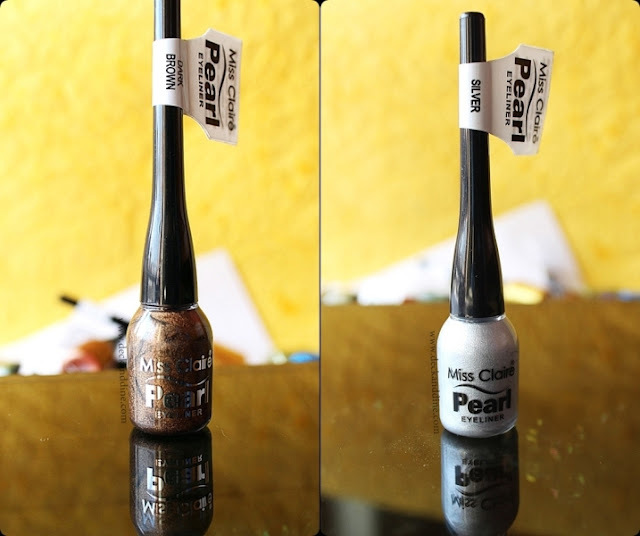 No matter if you are a pro at makeup or are still wondering where to start in the makeup world, this range is for you. 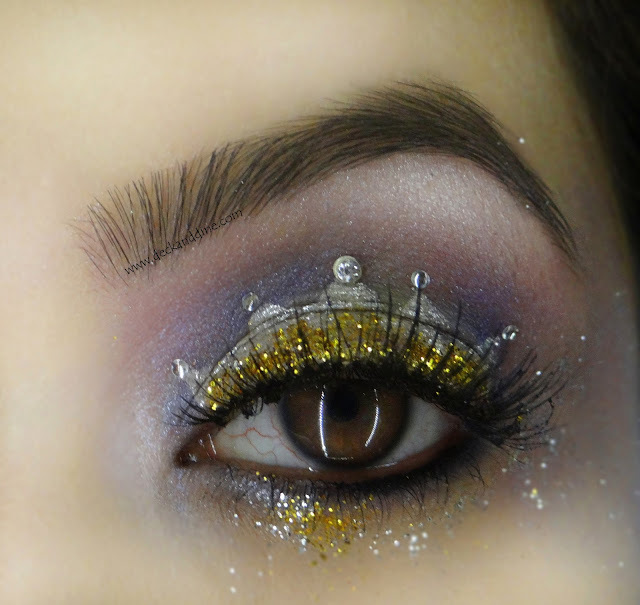 Sometimes the dirt cheap products can create magic that a lot of advanced level makeup products may not be able to create. 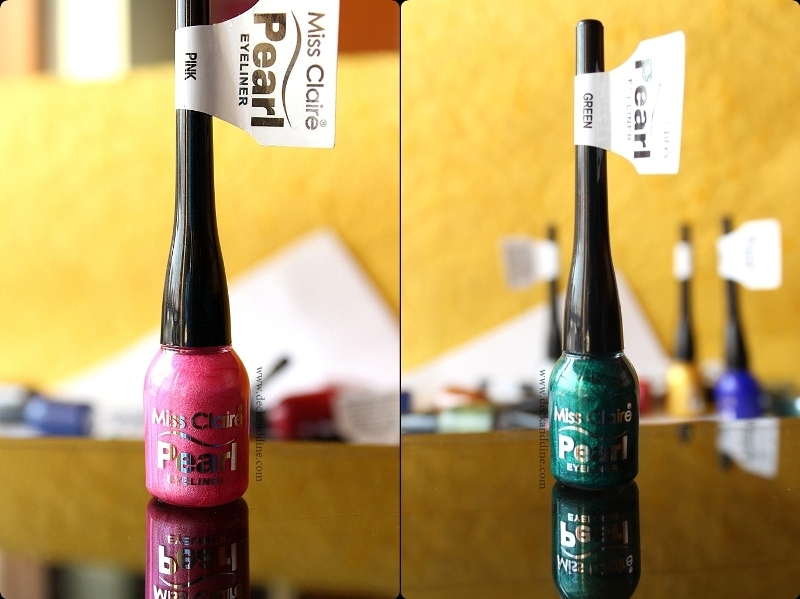 My love for Miss Claire products is increasing day by day. I am already planning to backup a few shades from this range. These are truly worth trying. 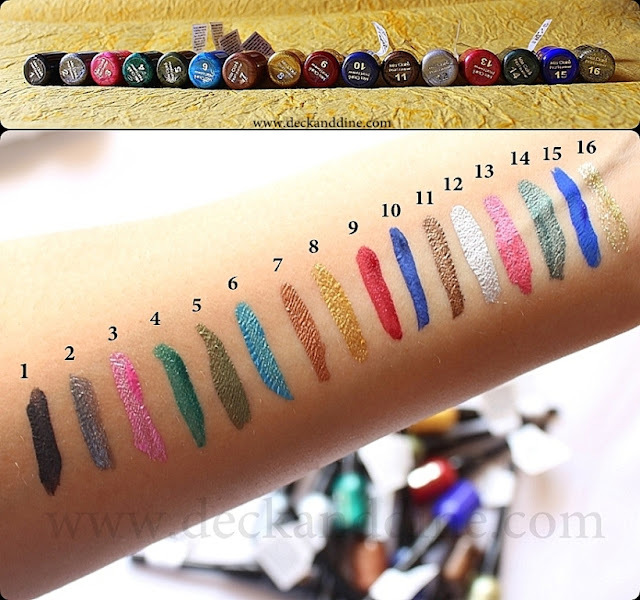 Some of the looks I created using Miss Claire eye liner..
Oh my gosh! Simply stunning each of the shades. I'm going to get my hands on few in my next visit to Kolkata. Thanks for sharing.